Applying makeup and hoping for the best, so you don't have to! Sephora? Don’t mind if I do! Husband and I were in the mall yesterday doing some clothes shopping, and on the way to the side of the mall where we parked the car, I stopped short, looked at him, and went, “Oh honey, I’m sorry.” He blinked, then realized what I’d stopped in front of and sighed: Sephora. Long-suffering husbands are the best! Since I teased with all those hand swatches last night, I decided today to try to do something using as many of those products as I could. As a result, you get a Face of the Day and some bonus product swatches! So. There’s me today. I’ll tell you right off to ignore how perfect my skin looks in the above photos; I used the “beauty” (aka “erase all the pores!”) mode on my camera to conceal my ongoing lip hair situation. The eyes and lips in the pictures are basically as they are in real life, though, and I’m a fan of all the products I used today! Shall we start with my eyes? Yes, let’s, because I desperately need to rave some more about this Be a Bombshell mascara. 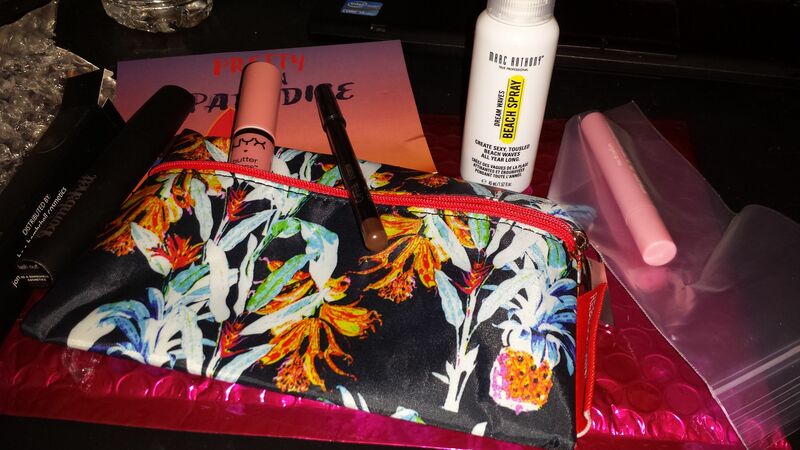 Yes, the one Ipsy hates. 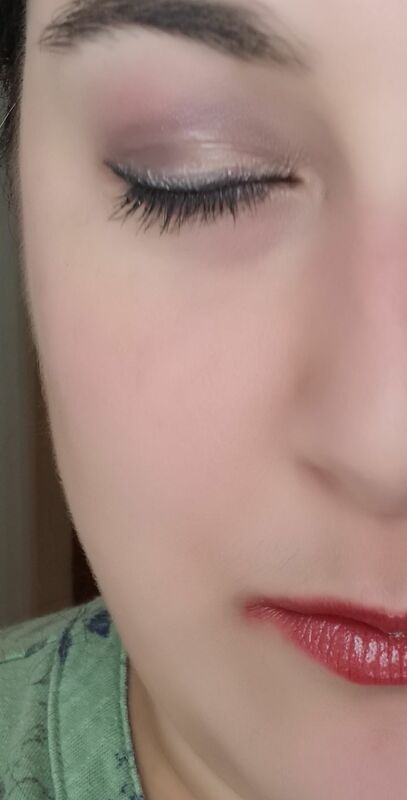 Because YOU GUYS LOOK AT MY LASHES. Incidentally, what is the angle I’m supposed to be taking mascara photographs at? Because this surely can’t be it. Look at them there lashes, Ma! 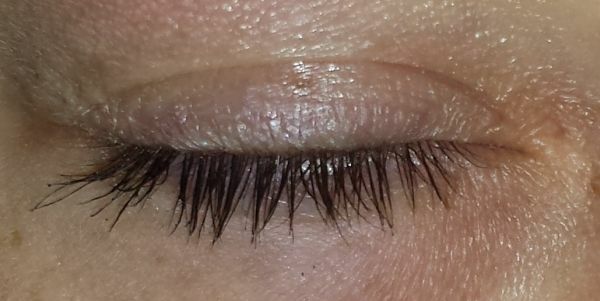 Notice that with Lash Out, the volume and quantity of my lashes is the same – they’re not clumped together into one mega-lash or anything – but they’re slightly thicker-looking and the length is much increased. This, right here? This is how I like my mascara, girls and boys. Now, on to lips! 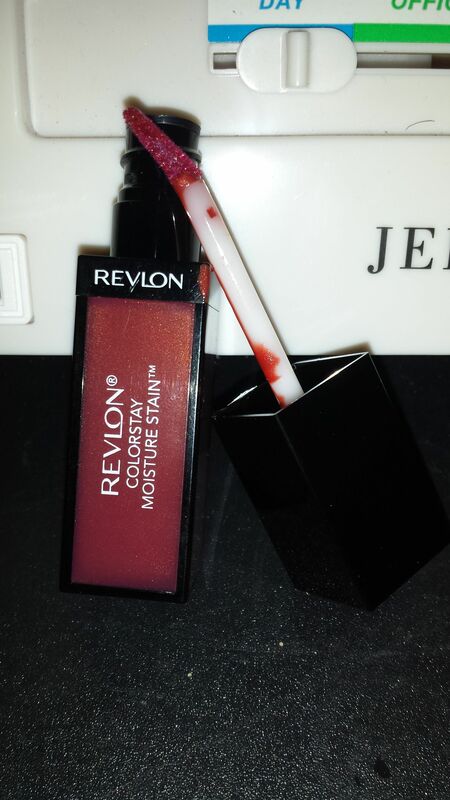 I just picked up this Revlon Colorstay Moisture Stain in Stockholm Chic yesterday, and I really liked the way it swatched on my hand, so I wanted to get it on my lips ASAP. On the plus side, this color is great on a paleface like me, because it’s red but it’s not, like, RED. It’s kind of like the color you’d get if you licked a red candy and then rubbed it on your lips. It’s also got a bit of sheerness to it (I know it doesn’t look like it in the photo, but trust me), which makes it not so in-your-face. Which means it’s wearable! Yes, I have no upper lip. I blame my mother. On the negative side, this formula is…weird. It feels a bit like slathering your lips in hand lotion, with that sort of fatty feel (am I the only one who’s accidentally gotten hand lotion on my mouth? I can’t be, right?) to it. I guess that’s the “moisture” part. The glossy finish mattes down some within about half an hour, but because of the shimmer in it, it still looks glossy longer than that. Because the doefoot applicator has a pointed tip, it doesn’t tend to distribute color completely evenly. You’d think the point would be great for lining, but mostly it’s just great at holding onto globs of color until it deposits them unevenly where you try to line. You can still sort of see that problem on the edge of my upper lip in the photo above. On the whole, though, the formula evens itself out after a few minutes, so it’s not a huge problem. The color has mellowed out quite a lot, but it’s not gone, it’s just lighter. There’s some fading around the edges, but the gloss finish has remained remarkably shiny. This is more longevity than I expected to get out of this lipstick, honestly; the shiny, wet finish did not inspire confidence. 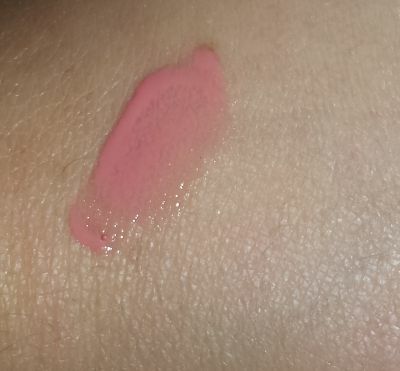 Actually, I was about to say that I still wouldn’t consider this a “stain” so much as a set lipstick, but then I decided to test that by rubbing away the color with my finger and, uh, it didn’t go anywhere. So yeah, it does seem to be a stain under all that fancypants moisture! So, there you have it. A “let’s use a bunch of products I have laying around and want to try” FOTD, with bonus lipstick and mascara reviews thrown in! 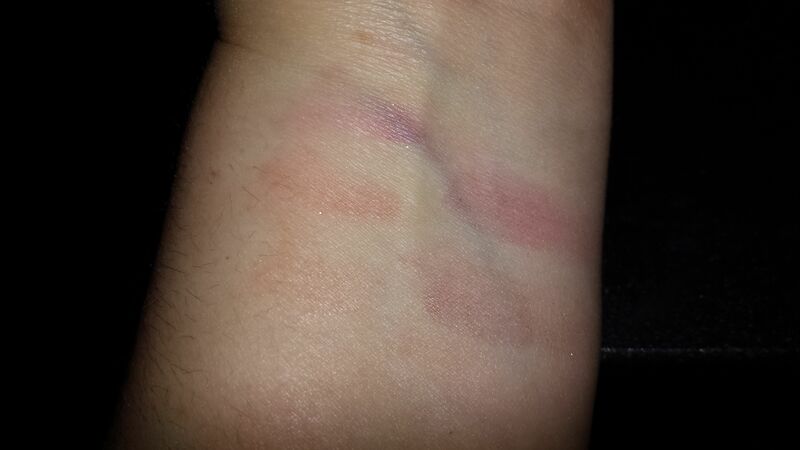 …where I start testing stuff out on my hand and end up looking like modern art. You can tell I didn’t intend it to get this out of, er, hand, because it goes backwards toward my arm instead of upwards on my hand like anyone who was planning this out would have done. I did a quick test-out of the mascara and the butter gloss on my bare face when the bag arrived. Unfortunately, close-up photography reveals that my upper lip is in serious need of a waxing, so you’re not going to get to see the gloss on my lips today. 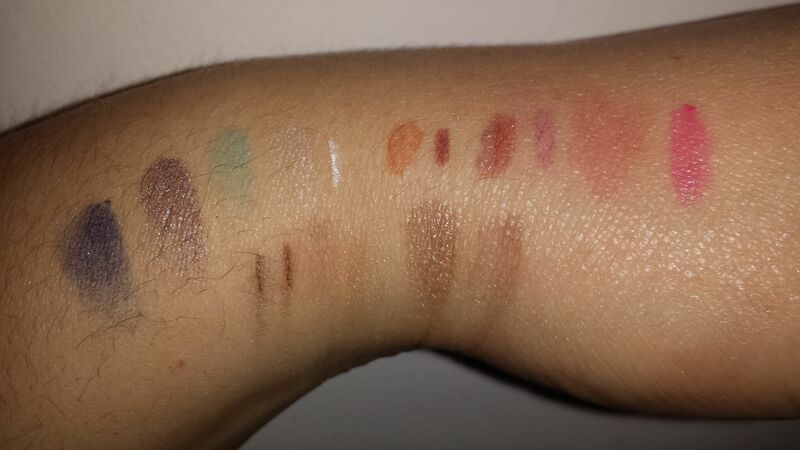 Instead, you get a super-informative hand swatch! Yay! I don’t tend to wear a lot of lip gloss these days – I’m either wearing plain old chapstick with no color, or I’m wearing full-on lipstick – but I can see why people like this formula. It’s really soft and, well, buttery on my lips. Feels nice! On the other hand, the color is a big “meh” on me – my lips are already very pale, and Creme Brulee (though it smells awesome!) just washes them out more. I can’t say this gloss has necessarily persuaded me to start wearing gloss more, but it’s made me curious enough that I’ll probably pick up a Butter gloss in another color next time I’m in CVS and see what I think of it in a color that doesn’t make me look like a zombie. At the $5 price point, it’s cheap enough to be worth a try, or even a couple of tries. 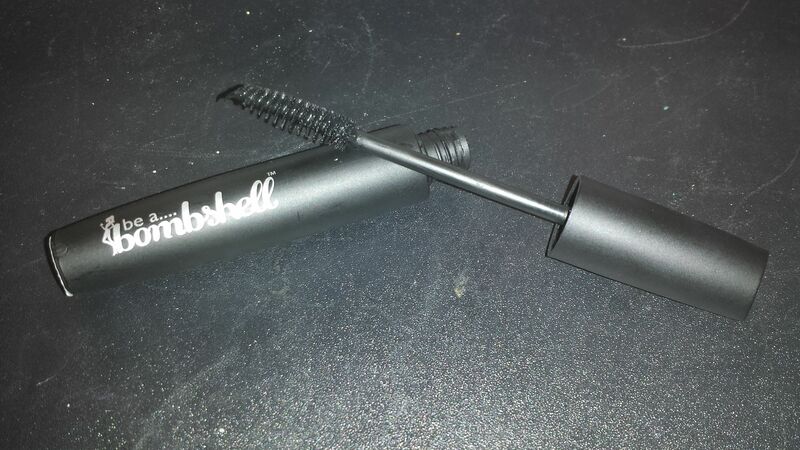 And now, Be a Bombshell’s “Lash Out” mascara. The internet is awash in Very Upset Ipsters complaining about the scent of this stuff. Descriptions range from “rotten” to “like a fuel refinery” to “chemicals with a side of garlic”. And yes, the scent when I opened my mascara and sniffed it was…not delicious. It does indeed smell oddly garlicky. But you know…I don’t generally stick my nose in my mascara. Opening the tube about 8-12 inches from my face, as I generally do when I’m going to put mascara on, I couldn’t smell anything. Ditto putting it on my lashes: no detectable smell. So yes, kind of stinky in the tube, but not in a way that would prevent me from using it, internet grar notwithstanding. That all said, this is not a mascara to run for if you’re into Big! Dramatic! Lashes! 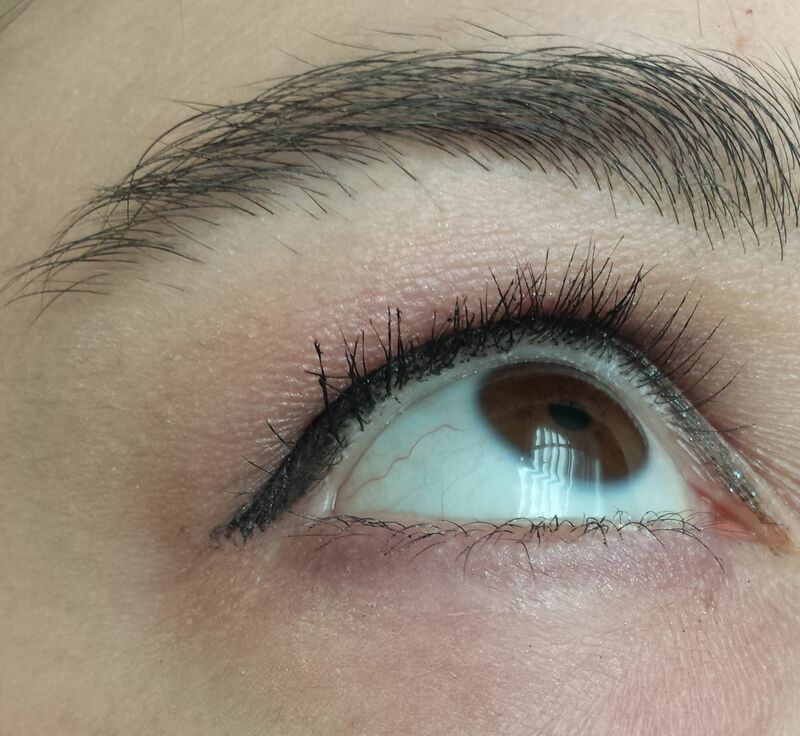 Here’s my right eye, with two coats of Lash Out on the top, one coat on the bottom. These photos don’t actually do justice to the fact that there is a difference, but it’s a more subtle one than we’re used to seeing in the age of mascara ads that use lash inserts, etc. Lash Out added a bit of length and curl to my lashes, but not dramatically. 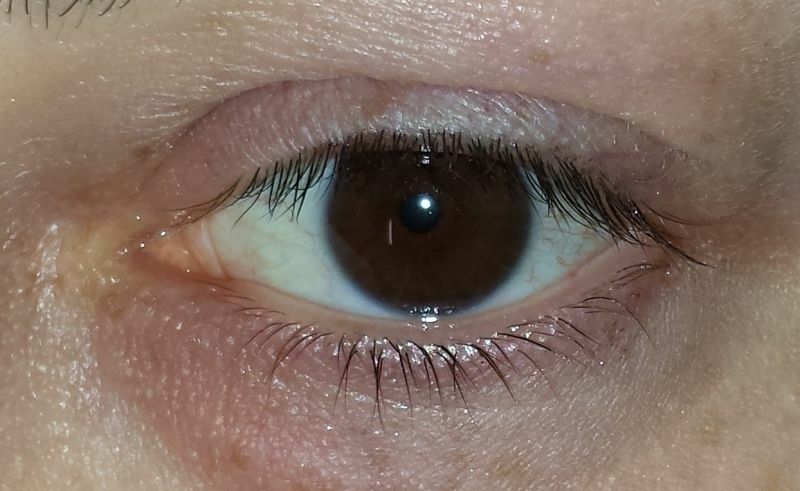 It’s most visible in these shots on my bottom lashes and at the edge of my eye. And actually, for me, the more subtle effect is ok. I have fairly long, dark lashes to begin with, and most mascaras seem to mostly just clump them up and give me anime eyes. That’s not a look I’m into; I prefer my lashes to look more like eyelashes than spider legs (though if you’re into that look, more power to you!). 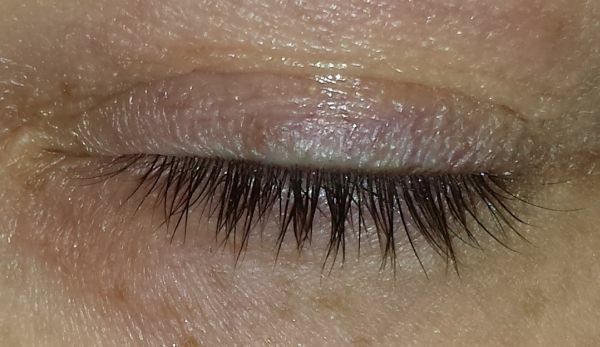 Lash Out definitely did the job there – my lashes look longer, but I still have every individual lash, and the curl is pretty “wow” considering I didn’t touch an eyelash curler. 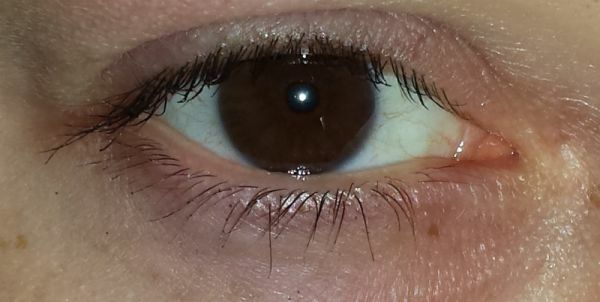 Amazingly (to me), I had no clumping issues with Lash Out, at all. Not one. No lash comb necessary or anything. So if you’re into dramatic lashes or unscented product, yeah, this isn’t going to be the product for you. If, on the other hand, you like your lashes to look natural and you can stand a product that doesn’t smell all that great out of the box, Be a Bombshell Lash Out Mascara is definitely worth consideration. It’s going into active mascara rotation for me, because this does what my L’Oreal Voluminous Butterfly mascara claimed it would do, and then didn’t. *bzzt* *PA system whine* We now interrupt your previously-schedule swatch week to bring you a polish longevity check! On the one hand, it’s obviously significantly degraded, and if I weren’t testing the formula, I probably would have taken the polish off before this. On the other hand…there really were no more chips after that middle finger. Abundant tip wear, yes, but no chips or flaking. No missing chunks that scream “if you don’t take me off right now, you’re going to look like a fool in public.” I’m actually impressed with how well this held up for a “nail makeup” type polish. 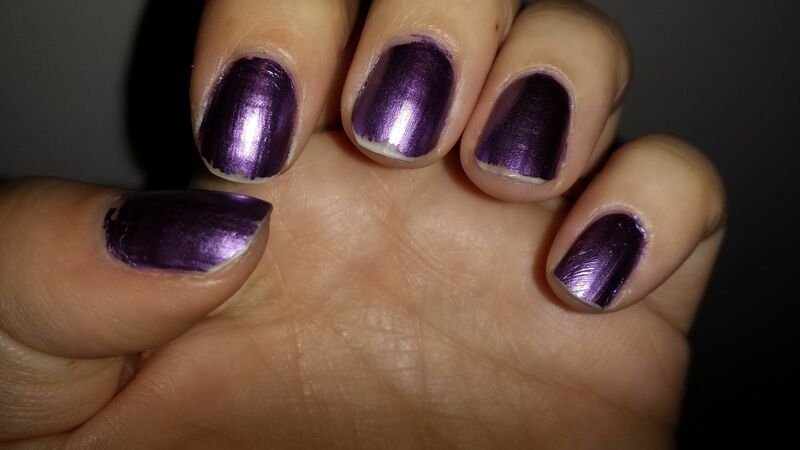 I could easily have touched it up with a tiny bit of polish to the tip of each finger and kept wearing it past day 5. Overall, as long as you go into your relationship with this polish knowing it’s not going to last long-term, it’s pretty darn good at being what it is. 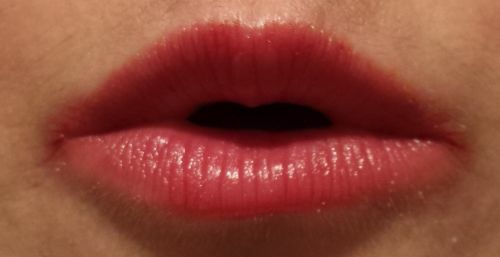 Yet more Revlon lip goodness for you tonight. Seriously, the balm crayons in all these product lines from Revlon are…it would be far too punny to say “the bomb”, right? Right. Won’t say that. But they’re awesome! And here’s what’s left after a good swipe with a tissue. These stain significantly less than the Matte Balms I swatched yesterday, but if you look closely at where the swatches were, you can see the glitter that’s left behind after the color fades. Only Enticing, out of this group, left much color behind to speak of. 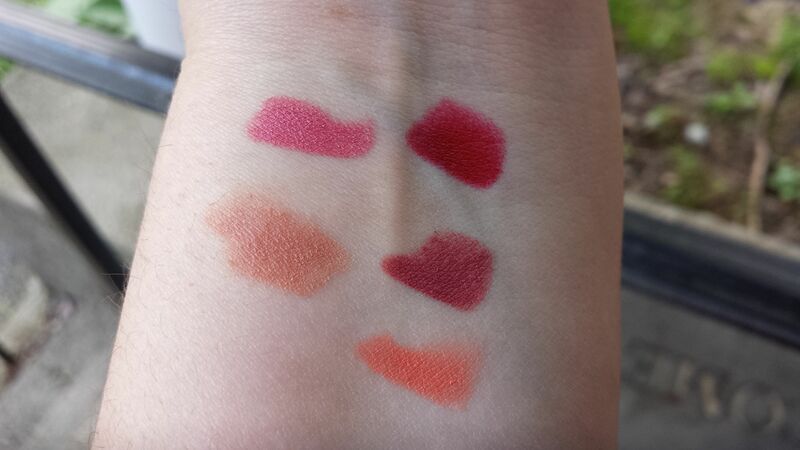 More swatching, yay! 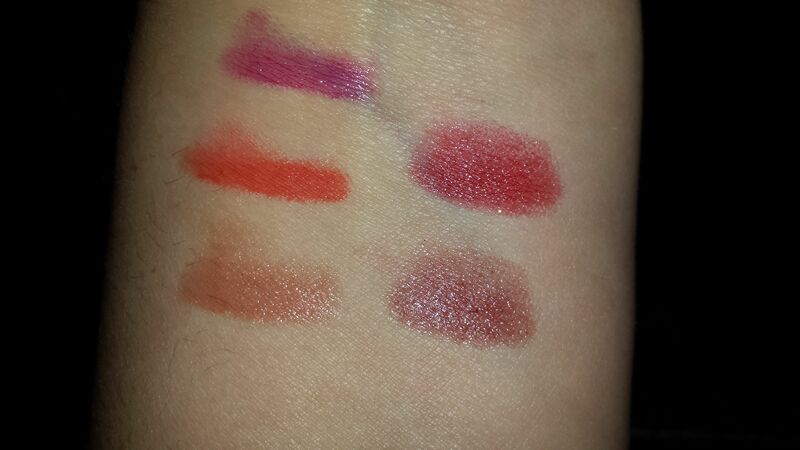 These are the five Revlon Colorburst Matte Balms I own: Complex, Elusive, Mischievous, Sultry, Standout. I’ve already done a complete review on two of these, Sultry and Standout. You can find that here. Swatch week continues! 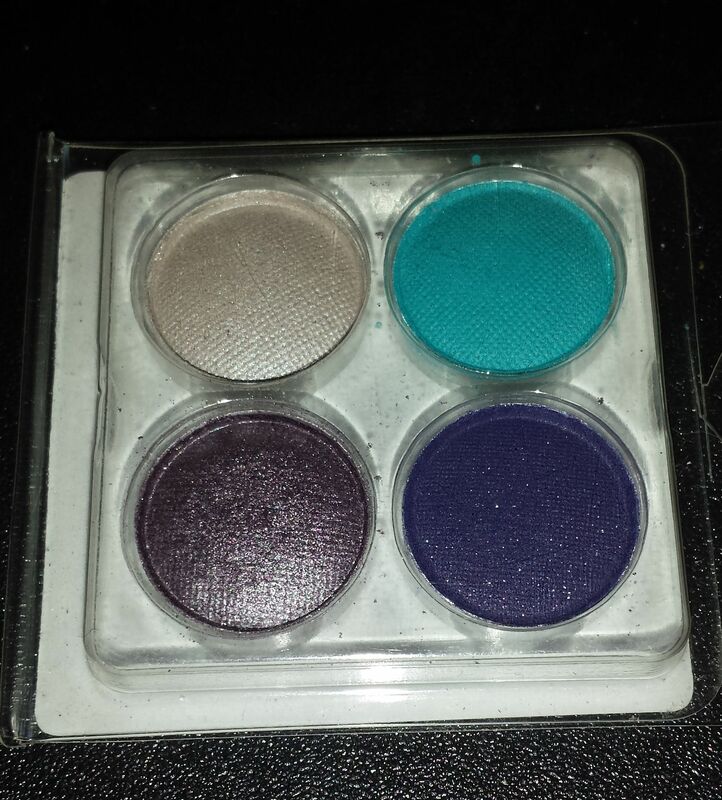 This palette literally arrived in the mail today, so I haven’t even had time to use it on my eyes yet, which means this is a perfect subject for quick swatching. 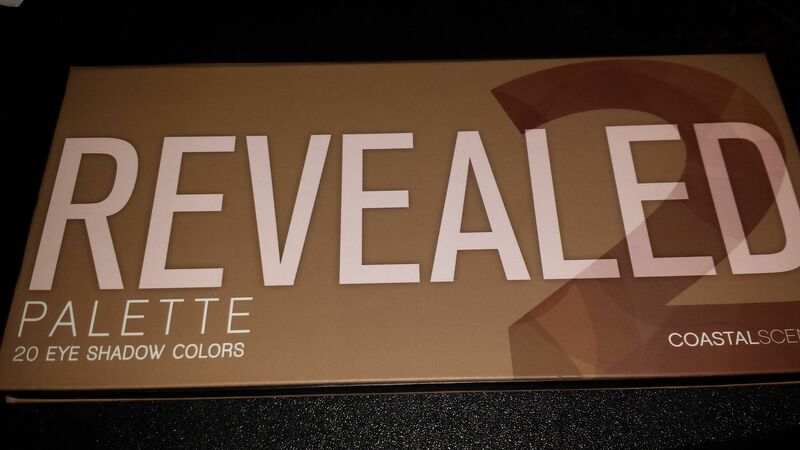 Meet the Revealed 2 palette from Coastal Scents. This retails for $19.95, but I got it on sale for $9.95. Inside, you’ll find twenty eyeshadow shades, a mix of shimmers and mattes (though some of the mattes have a bit of a satin sheen to them). 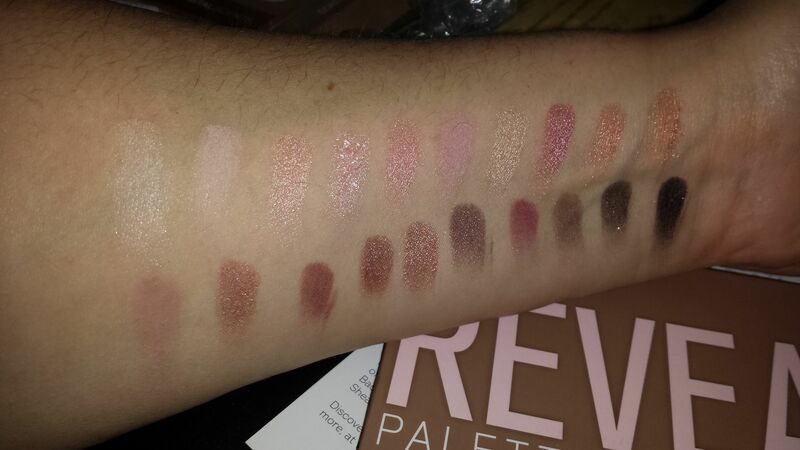 This palette is supposed to have some dupes for Urban Decay’s Naked3 Palette. I don’t own that one, but from eyeballing the colors in Revealed 2 and what I’ve seen of Naked3 online, this seems about right – a number of them look similar. 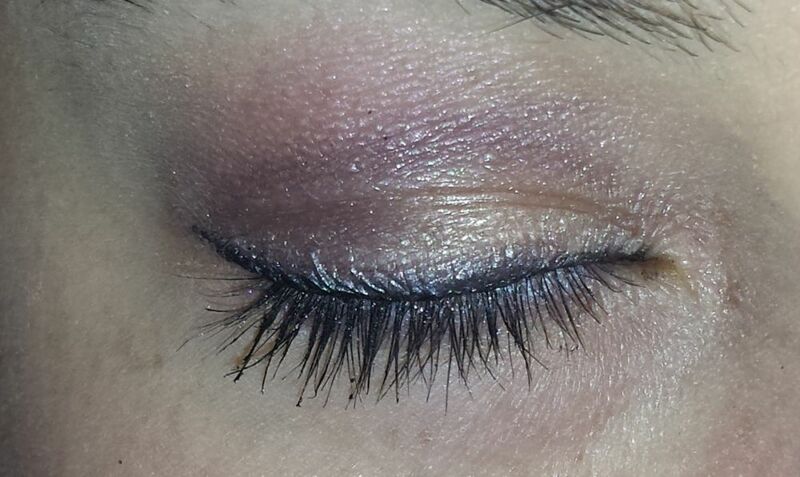 There are definite rose gold undertones to most of Revealed 2, just like Naked3 is supposed to have. 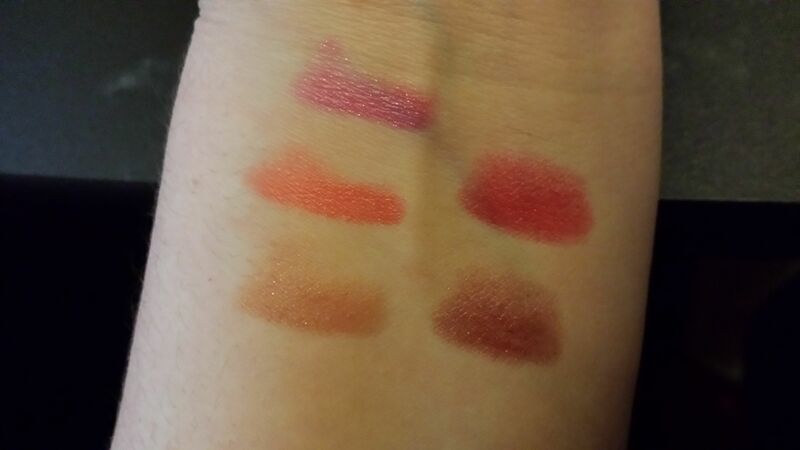 Here is a set of pictures from a reddit thread of someone swatching the two together for comparison. 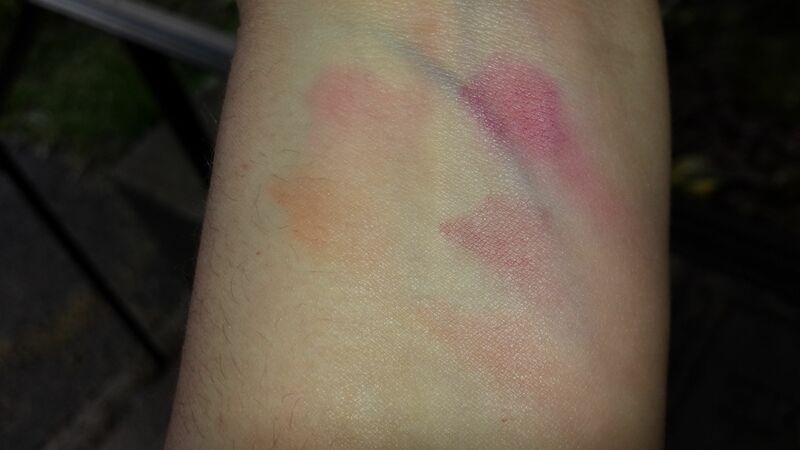 Oh, and all the swatches you’re about to see are on my bare arm, no primer, so they’ll be even more intense if you use primer. Here are the Revealed 2 colors in natural, overcast light. 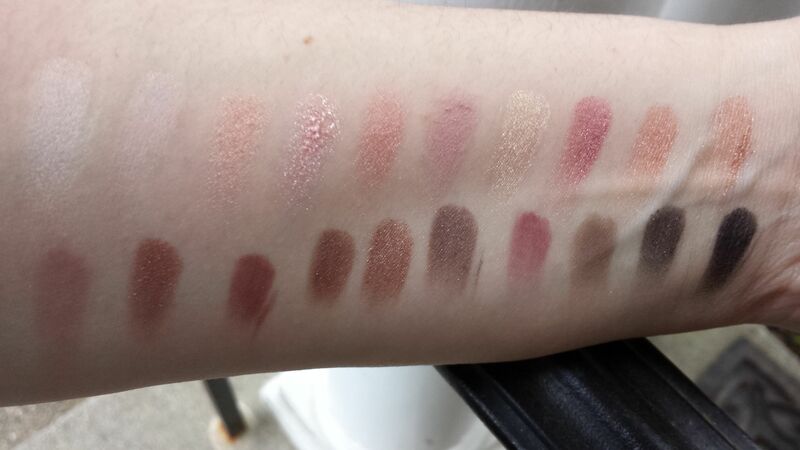 Top row of the palette is the top row on my arm, bottom is bottom. And here’s the same thing with a flash indoors. As you can see, the pigmentation on these varies on my skin tone, but most of these shadows are quite smooth and pigmented. 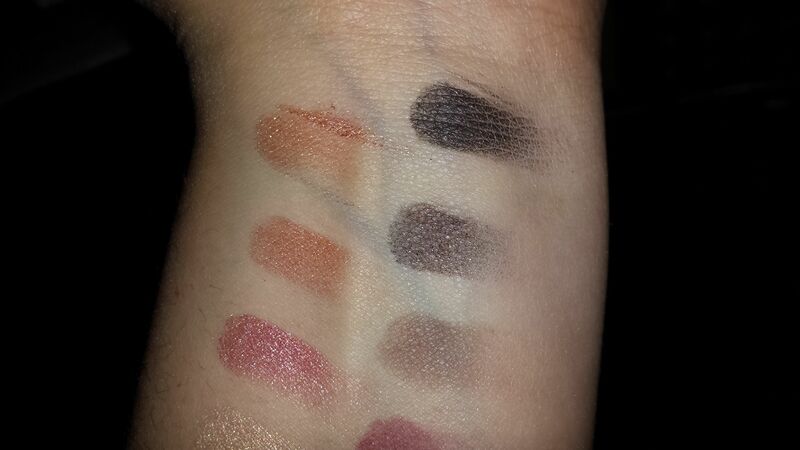 In general, the matte shades seem to be a bit less pigmented than the shimmers. And here’s a close-up of the shades closest to my wrist, because I’m a terrible contortionist and couldn’t do those justice in the full-arm shot. 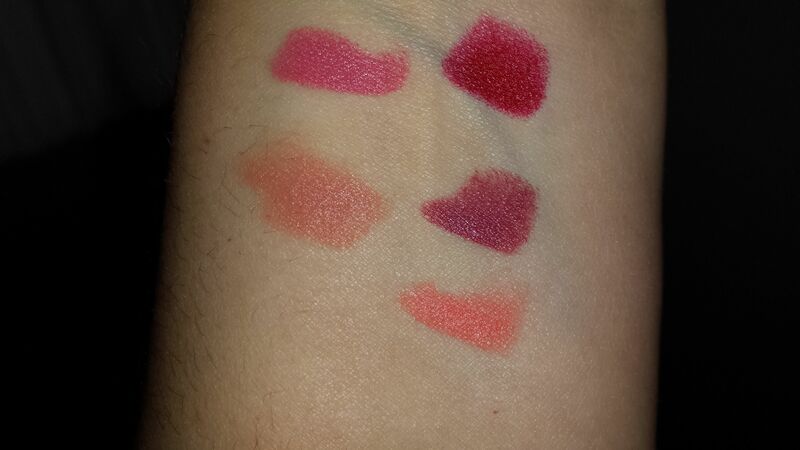 Note that the second color down on the right is not a plain charcoal black; it’s similar to Naked3’s “Blackheart” shade, black with red sparkle. So far I really like what I’m seeing here (and I’m really quite excessively proud of myself for getting this for $10 instead of Naked3 for $55, if they’re really as close as they seem); can’t wait to try these out on my eyes! My posts have been coming really slowly lately, and I think part of that is because I’m putting pressure on myself to write nice, comprehensive reviews of everything I’m posting about. But I know that when I go hunting for a product on beauty blogs, the thing I’m mostly interested in is seeing the product in use, on/against someone’s skin! Reviews, while useful, are sort of secondary. So to try to shake myself out of this rut, I’m going to devote the next few posts to swatches and quick comments about many things, rather than trying to go in-depth on a few. Today, I’m doing a sampling of manicures I’ve worn in the past few weeks. Some were awesome; some were…not. All of them will display my usual utter lack of talent when it comes to cleaning up around my cuticles, so I apologize in advance for that horror. I loved the color contrast in this manicure (and both formulas are a long-lasting dream), but it was my first time going back to plain creme finishes after a few weeks of fancy glitters, and I got bored of this quickly. This was a complete failure. I really wanted to make “Make Waves” work, because that iridescent sort of seafoam greenblue is awesome, but this formula was so. damn. sheer. Even four coats on my swatch stick couldn’t opaque it up, so when it came time to put it on my hands, I decided to try layering it over a white polish. Unfortunately, the only white polish I own is also prone to streakiness. So I piled on two coats of L’Oreal’s “I Will!” trying to get that evened out, and then followed it up with three coats of “Make Waves” for a still-not-completely-opaque finish, and by then I had so many damn layers of paint on my fingernails that they still weren’t dry a few hours later and I dinged them all to hell every time I moved. So yeah, this lasted about six hours before I gave up and took it off. 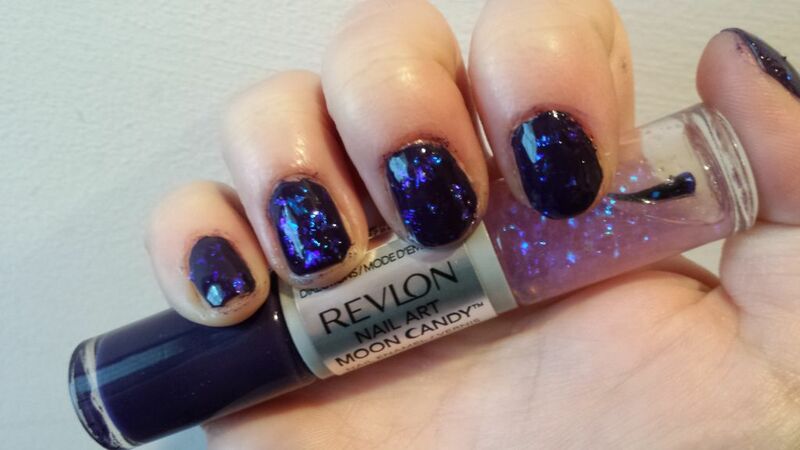 This was my first try at Revlon’s new Gel Envy line. 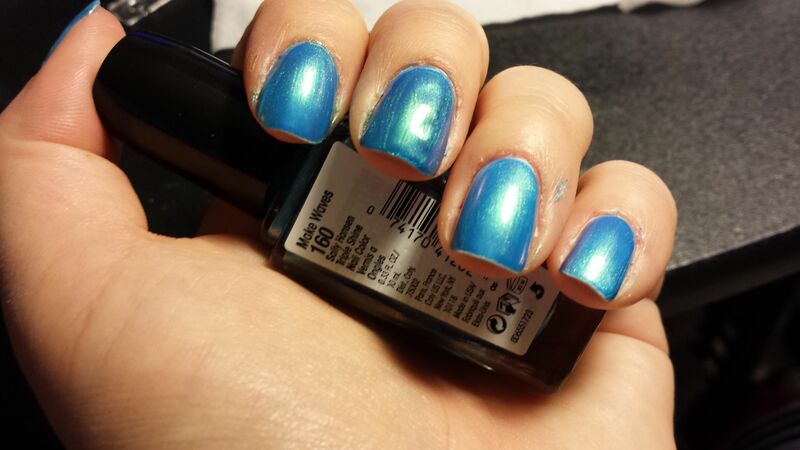 I bought this and the line’s topcoat and tried them together. 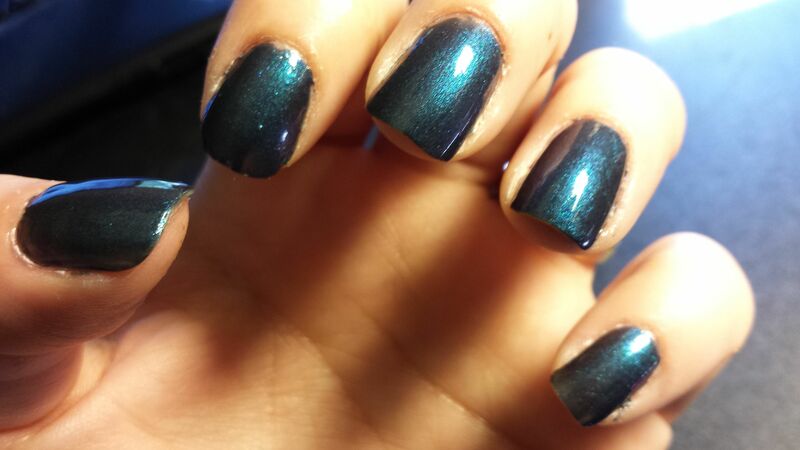 Love this color, a vampy sort of dark blue. The wear time was really good – I think I got a week out of this – and removal, despite the glitter bits, was simple. The only complaint I had here was that the Gel Envy topcoat, which I used instead of my usual Seche Vite, dulled down faster than I would have liked. So the manicure’s shine only lasted me a few days, followed by a few days of “polish still unchipped, but it’s not really popping”. 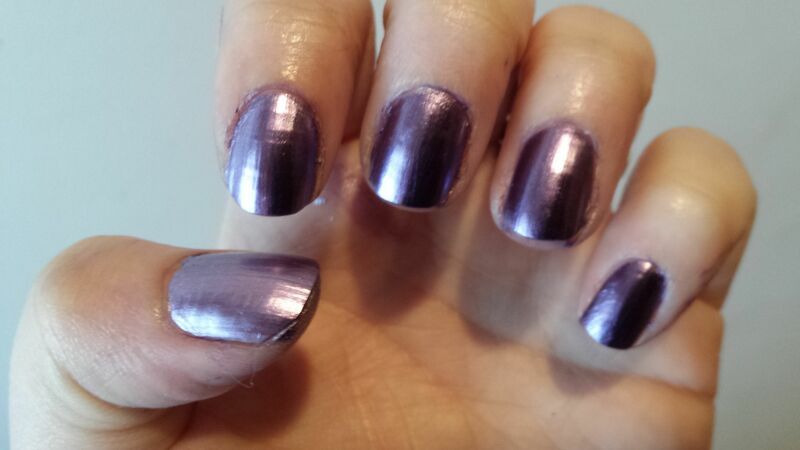 The next time I tried a polish from this line (“Showtime”, a sparkly purple I forgot to take pictures of, sorry! 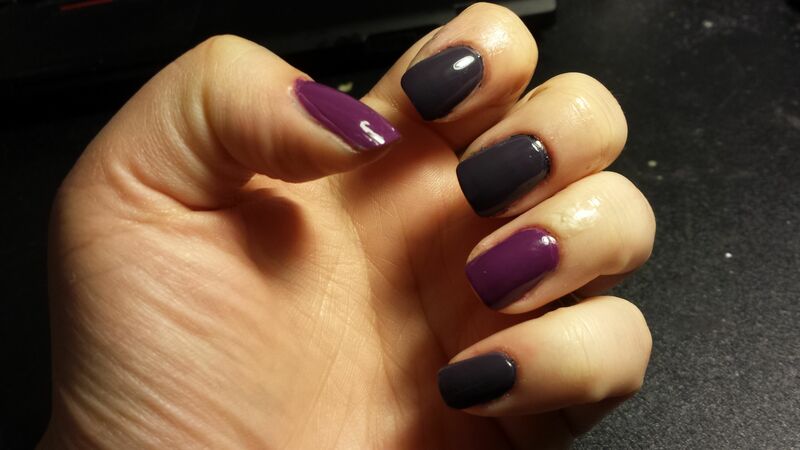 ), I topped the Gel Envy topcoat with Seche Vite. This is the polish I just took off today. I’d say that while this was brilliant in concept, the execution went a bit wonky. The creme polish in this duo is a really pretty dark blue-purple, but it’s a bit on the thin side, and I got it all over pretty much everything when applying it. On the bright side, it’s pretty close to a one-coat wonder (I did two here just to be sure, but I probably didn’t need to). See that patch on the upper right? That’s where Vite and Orbit had a fight and I was left with some chewed-up looking glitter. 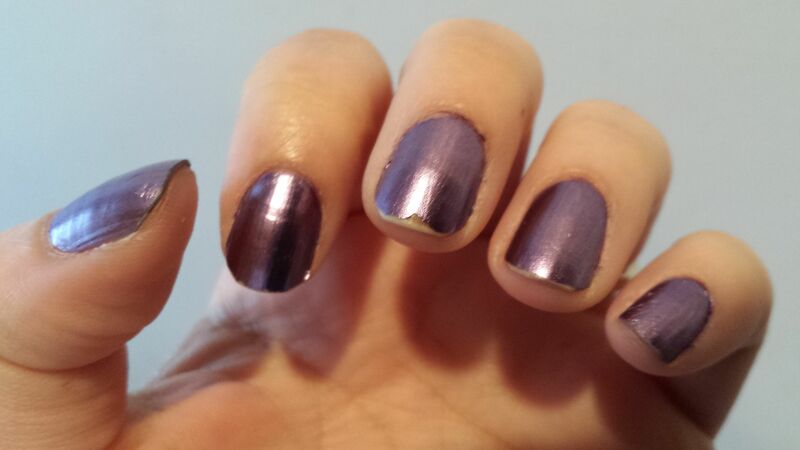 The Seche Vite also didn’t completely even out the finish on this, so my nails looked chunky rather than smooth. 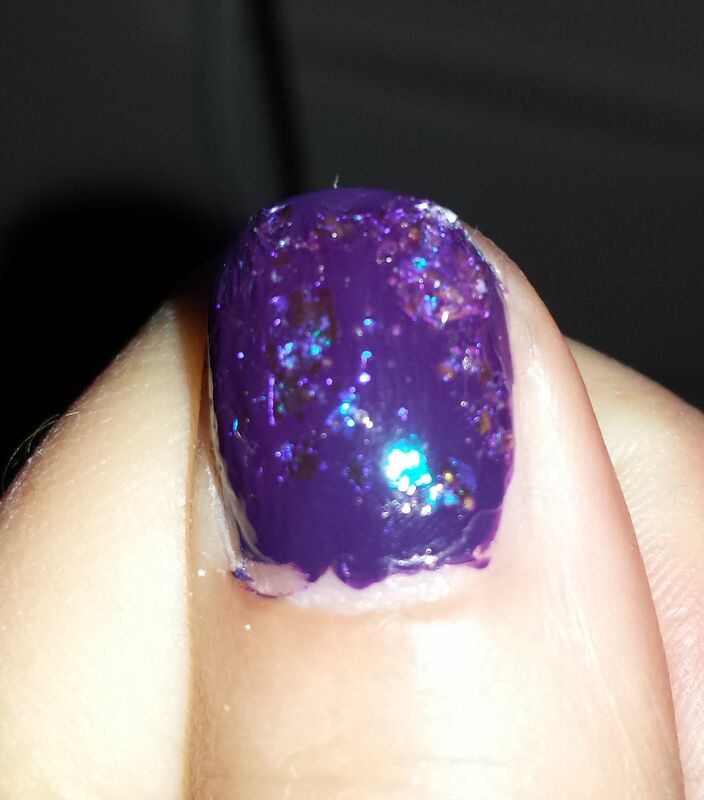 Also, this stained my nail beds hot pink, even though I used base coat under it. Why hot pink, for a dark purple polish? Dear reader, I have no more idea than you do; just keep it in mind if you decide to pick this up. 1) That it’s labeled “nail makeup” rather than “nail polish”. For no particular reason, I suspect this to be code for “it’ll last about as long as you leave on face makeup, rather than as long as nail polish does”. The label also explicitly notes that you should “touch up as needed”. Yeah, I don’t think I’m going to get a week out of this baby. 2) You know how all nail polish tells you to “shake well” and you’re like “yeah uh-huh, looks fine to me” and you maybe give it one halfhearted shake and call it good? Yeah, no, you can’t do that here. When they say to shake they mean it, because the purple pigment and the silver “foil” pigment separate, and if you don’t give it a good five-second shaking, you’re going to end up with some purple streaks and some silver ones. Oh, also I got this one everywhere when trying to put it on, too. Yay me.